Summarizing the complicated and varied technology in the field of MRI in a brief description represents a challenge. However, it is helpful to know the basic types MR techniques and terminology as the technology has become ubiquitous in patient care. The following is by no means a complete description of MR technology but can help to orient someone new to the field. Magnetic Resonance Imaging is based on localizing hydrogen atoms in tissue using radiofrequency wave pulses in an applied magnetic field. 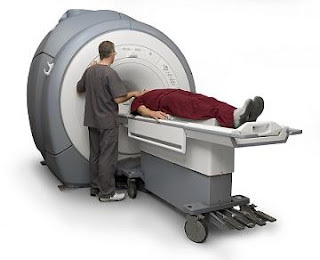 As the patient lies in the scanner, a magnetic field is applied, which causes the hydrogen proton in the body to “spin” in the direction of the magnetic field. There are two major types of magnets used: permanent magnets and superconducting magnets. Permanent magnets can be thought of a two bar magnets made of metallic alloys that produce a inform magnetic field between them. Another type of magnet is a superconducting magnet, which is encased in liquid helium to prevent energy loss. A scanner’s ability to translate hydrogen proton spinning into a high-resolution picture is very much dependent on two types of MRI coils: gradient coils and receiver coils. Gradient coils are essentially cylindrical loops or half-loops of wire that carry current. These loops create a three-dimensional magnetic field gradient across the x-, y-, and z-axis of the field of view. The hydrogen atom will spin with a unique frequency that is proportional to the magnetic field at that point in space. This helps the scanner with spatial localization and affects image resolution and quality. Turning the imaging gradient coils on and off is what gives MR its characteristic loud noise. Another important factor is the homogeneity of the magnetic field across the field of view. Other coils, called shim coils, correct unwanted heterogeneities to the main magnetic field. Manufacturers often compete with their products gradient coil packages to produce faster scanning times and higher resolutions. Radiofrequency receiver coils are used to receive magnetic signals from the region of interest within the body. There are several types of receiver coils used in scanners today. There are specialized receiver coils for particular regions of the body, for instance spine, temporomandibular joint, shoulder, knee, and pelvic. Most of these coils merely receive signal, with the exception of head and whole body coils. There are also phased-array coil systems in which signal is obtained from several small coils simultaneously to scan a large volume, such as in spine imaging. When acquiring an image of the patient, the scanner emits a radiofrequency (RF) wave pulse as the magnetic field is applied. Depending upon where it is in space and its chemical environment, the proton will rotate away from the magnetic field vector when excited by the RF pulse and then relax back towards the vector of the magnetic field. There are two main independent ways the protons relax. One is called the T1 relaxation time and the second is the T2 relaxation time. In conventional spin-echo imaging the operator can vary the pulse sequences to emphasize T1 and T2 weighted effects. T1 weighted images are used for tissue discrimination and in conjunction with the gadolinium contrast agents because enhancing lesions become bright on T1 weighted scanning. T2 weighted images are sensitive for the presence of tissue swelling as well as detecting pathology that can alter the magnetic properties of tissue. One type of T2 scan that is heavily favored by neurologists is FLAIR (Fluid Attenuation Inversion Recovery). FLAIR is a T2 weighted scan where the pulse is modified so that bodily fluid appears dark instead of white, as in a standard T2 weighted scan. This is useful in imaging the brain because cerebrospinal fluid appears dark, allowing close examination of areas of the brain around white matter. For instance, multiple sclerosis plaques or ischemic foci from a stroke are easier to see. One of the limitations of FLAIR for neurologists, however, is that posterior fossa structures in the brain often produce artifacts in the image, therefore reducing accuracy. Another technique commonly clinically employed is MR angiography. This technique utilizes intensity differences created by flowing tissue (such as blood in vessels) and stationary tissue. One can create three-dimensional images of the patient’s circulatory system, such as detecting aneurysms in an artery. This is useful because it creates detailed images that can be rotated in three-dimensional space on a computer screen for the clinician to examine. Also, the patient does not receive x-ray radiation as in CT or conventional angiography. However, conventional angiography is still considered the gold standard for vascular imaging as it has superior sensitivity to MR angiography in most clinical situations. Finally, Diffusion Weighted Imaging (DWI) is another major clinical application of MRI that should be mentioned. DWI scanning is used to detected areas of restricted diffusion of water molecules in tissue, such as in swollen, edematous tissue. DWI is frequently used to evaluate patients who have recently suffered a stroke (an acute stroke). DWI can detect strokes produced by a clot within hours of onset, so patient’s can qualify for therapies that can potentially salvage brain tissue. However, DWI also produces images with artifact, so another image is produced called an ADC map that is used to identify artifacts within the images.